While some agencies in the US use the National Missing and Unidentified Persons System (NamUs), many don’t. 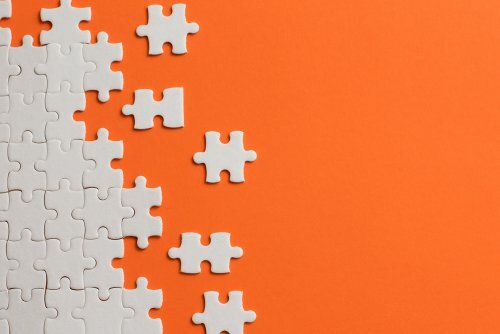 We spoke with Todd Matthews, director of NamUs Communications and Case Management, to learn more about how local agencies can benefit by using not only the NamUs database/case management system but all of the resources that come with the NamUs program. 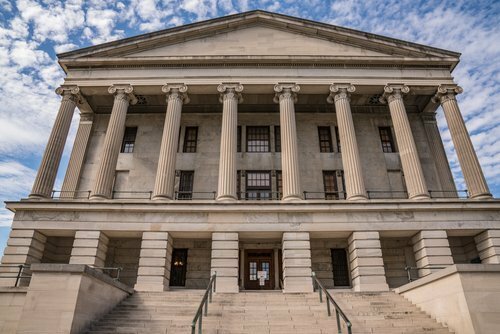 Justice Clearinghouse Editors (JCH): Tell us a little bit about NamUs, its history, how it got started, and what it includes. Todd Matthews: Well, a lot of people know that NamUs is a National Institute of Justice program (NIJ). And for many, many years there’s been a problem with missing and unidentified persons, the unidentified in particular. It’s the nation’s silent mass disaster: there are around 40,000 unidentified human remains across the country and that is a big problem. It’s a problem in many ways… like for the medical examiner. What about the disposition of the remains? Do you bury them? Do you store them? Do you cremate them? Cremate and bury at sea? Then what happens when people come forward? 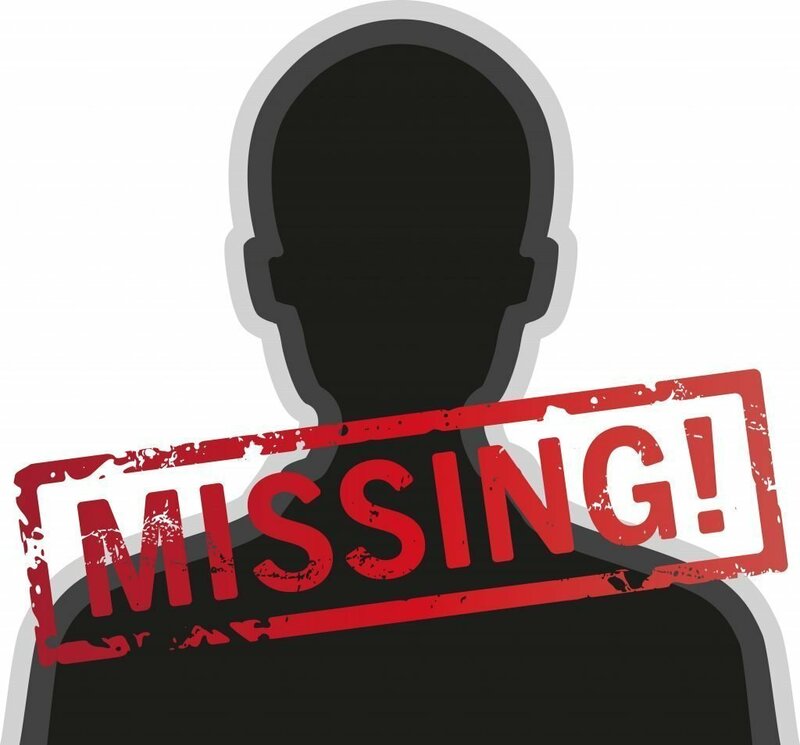 There had to be a way to case manage this at a national level because literally, a person could be classified as “missing” from one county and “unidentified” in the next county over. So there is a working group that was put together and they created the unidentified deceased database. That’s why NamUs is still called a database. In 2007, I got a call from the justice department to join the working group to create the missing persons database, which was to join the current existing unidentified decedent database. So it worked out really well and we did create unidentified decedent database. We connected it to the missing person database and the data could flow back and forth between the two systems, and matches could be made based on chronology, geography, physical characteristics. The system could make recommendations: this might be your unidentified person, or this missing person and vice versa. JCH: Interesting. So tell us about the overarching problem of the missing and the unidentified. How many are there? And as I understand it, there’s some discrepancy in the numbers just because of consistency in terms of reporting. Can you describe this problem from a statistical or numbers perspective? Todd: There currently is no mandate nationally to report to any one database. There are lots of fragmented databases — some that we work well with. Like, for example, the National Crime Information Center (NCIC). If you have a person that’s unidentified and it’s not a homicide, like a suicide or found dead, so no crime here … and traditionally, medical examiners and coroners don’t have access to NCIC. So there was no “NCIC for the dead” that was managed by the coroners and medical examiners. 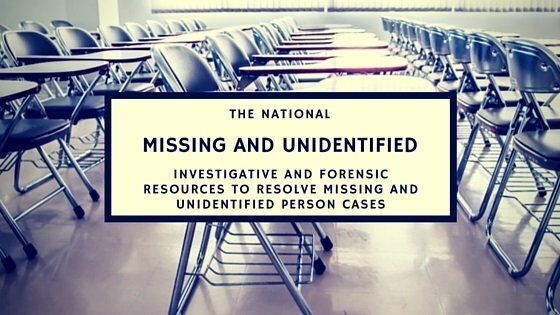 Since there’s no mandated repository and there’s no legislation that requires reportings of missing adults to take place at the local, state, and national level. There are laws being written now that will mandate that in certain states, but until all 50 states are on board, we’re still going to have estimations and fragmented information. So, based on the estimations I get, there are anywhere between 80,000-100,000 missing persons in the United States at any given time. I’ll get statistics from different people at different places at different times, so that number is going to vary greatly. I don’t think anybody knows an exact number. As for the unidentified, there’s an estimate that there’s 40,000 but that’s merely an estimate. We really don’t know. I’ve spent the last decade trying to pursue that number. That has been the goal. I didn’t think it would take this long [to be able to determine a number for the unidentified], but it has. We’re not done and I don’t see an end in sight. JCH: What percentage of law enforcement actually uses NamUs? If they don’t use NamUs, what do they use? Todd: You know, under the current system, [let’s call it] 1.0, it is going to be very difficult for me to give you an idea of a percentage of law enforcement agencies that use NamUs. I’m hearing that there are about 16,000 agencies out there and no, we don’t have anywhere near that many registered law enforcement users for NamUs. But there are agencies like my local agency here in Livingston, Tennessee, where we have one missing person and no unidentified in Genesee County. So they’re not registered users of NamUs. Why would they be? Until they have a need for it, why would they use it? But as agencies begin to build and refresh their critical incident plans, I think that agencies will have more reason for their staff to know and understand NamUs, how to use it, etc. is not the same as being entered in the system. It’s there but it’s not searchable. It’s available as needed, but it’s not being proactively used. JCH: Understand. 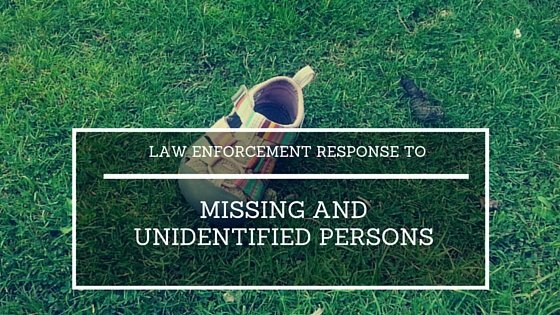 So law enforcement agencies really don’t use NamUs because in many cases, they don’t have an ongoing need for identifying missing people or unidentified bodies. Todd: That’s exactly correct. If they don’t have a need for it or if they’re not having a huge problem, then they’re not needing a case management system. NCIC is not a case management system. NamUs is a case management system. Many see NamUs as a forensic service provider but actually, the most important thing we do is case management. That’s first and foremost, all the information our team gathers goes into one place — and then start applying forensic services as needed. JCH: So there’s NamUs, there’s NCIC and what other services might they be using? Todd: Some people will have a local database. For example, I think Ohio has a system that they put their missing and unidentified in. A lot of people have abandoned their state website or systems because, with NamUs, you can create a portal in that’s very specific to your area, so you’ll only see the missing and undefined of your area. JCH: So what benefits would law enforcement get or have by using NamUs consistently? Todd: We can help identify some of the gaps they have in their records or cases based on our experience. A local law enforcement officer might have only done this once or twice in his or her whole career, but we do it every day. So for example, when we say something’s of vital importance, like, do you have the dental records? While you might know that the local doctor has them, unless you have them in your hand, things happen. Ten years later, if you go and you ask the doctor, you might find out he purged those records, doesn’t have them anymore. We urge the officers, let’s get all the information in the system. We prompt them to go and get the data that they might just be satisfied, knowing where it is, even if the officer doesn’t have it in hand. Or you’ve got a DNA sample and it’s in a drawer and it’s not submitted. Well, you need to do something with that. Being available is not the same, it’s there but it’s not searchable, it’s available as needed, then it’s not being proactively used. JCH: So part of local area law enforcement using NamUs is that they also get access to you and your team of experts to help them make, to have every opportunity to solve the case? Todd: I think we can bring big time forensics to small town cases where they don’t have the…they don’t necessarily the day-to-day expertise in certain areas. We can help you by processing or treating that case, giving it the level of importance or care you get at an agency that deals with this every day. So I think we’re equalizing force that ensures agencies of all sizes and locations have the same available services to help solve their crimes. JCH: So in a lot of ways, using NamUs, especially for those smaller towns, is a real benefit. Todd Matthews: Yes, it’s a huge benefit and they have access to forensic services that they don’t normally have. I like to use the example from Star Trek … how the emergency medical hologram runs in the background until it’s needed. So for many smaller agencies, they don’t need a big DNA lab, or forensic odontology, or a light and print unit every day. But once they need it, let’s go to NamUs. NamUs has all of these virtual resources, all of these people who are working remotely in the field, there to help you. Most local agencies can’t maintain that unit in their local budget, or put people on retainer for that, but when you use NamUs, you kind of do because we’re there for you.